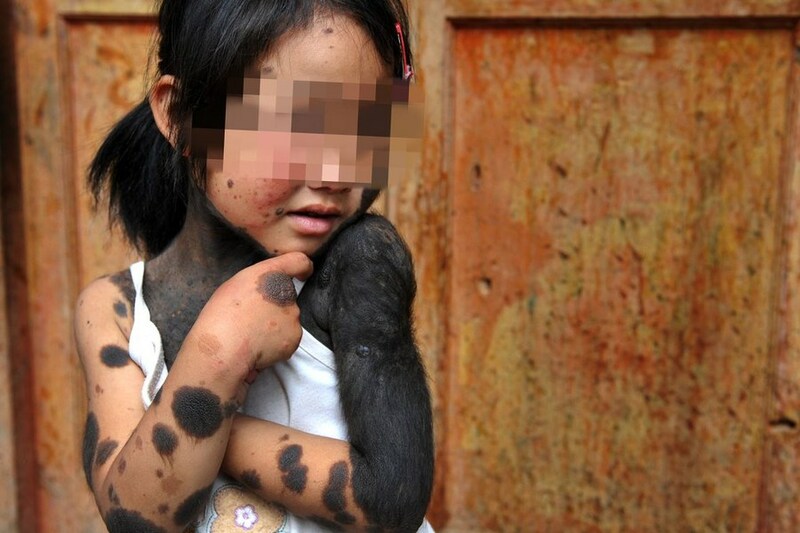 Lili was born with these black spots, and when she was two years old, her mother could no longer stand this “fur child”, and in her frustration abandoned Lili, never to return. Her father, who had been working long-term in Guiyang brought her to a children’s nursery, and never reappeared. In the half year she stayed at the nursery, Lili scared the other nursery children to tears. The person in charge of the nursery put an ad in the newspaper, asking Lili’s family to take her home. By coincidence, an uncle working in a Guiyang repair shop saw that newspaper ad that day, called Liu Mingying, and good-hearted Liu Mingying took her back to the village. While taking photographs, Lili was constantly scratching these black spots. Lili says these black spots only itch but don’t hurt. Naughtily, she even used her finger to point at these black spots but upon counting to 5, she couldn’t count any further. She says she doesn’t know what number comes after 5. 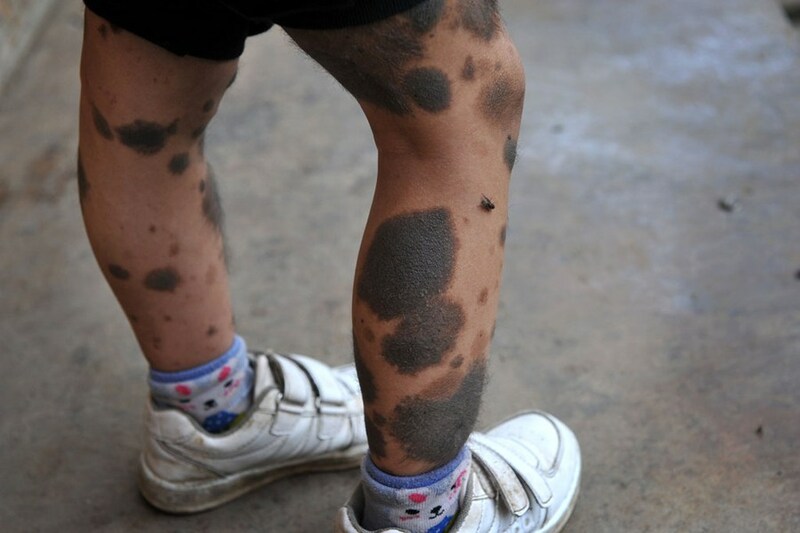 There are black spots the size of fists and coins spread over her body. On these spots also grow downy black fur. 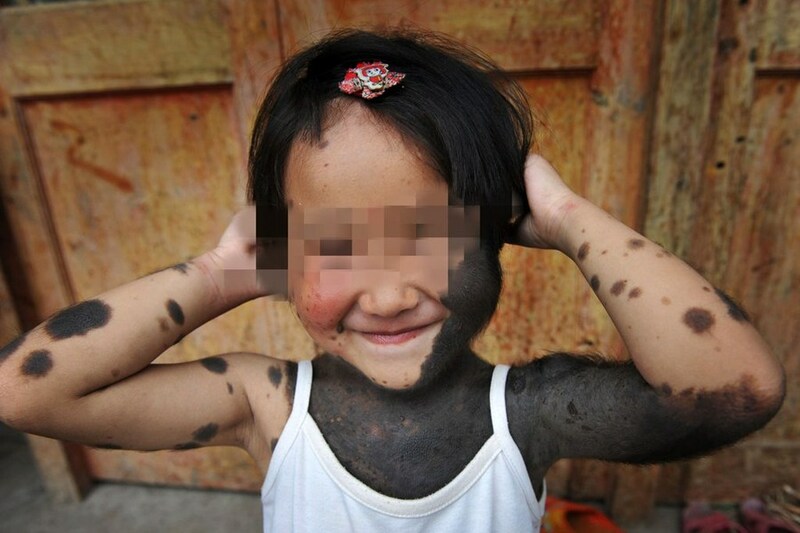 These black spots cover over 60% of her skin. Lili is very lively and energetic, and loves to laugh. She also tries to find other children to play with, but the other little children either run away scared or make fun of her. Over time, Lili had a nickname: Little Monkey. Just 100 meters across the front of her home is the village primary school, but Lili has never gone inside. Not only is it because her family is poor, they’re also deathly afraid of the little children who normally call her “Little Monkey” not accepting her. Genetic mutation, atavism, something the present world is unable to cure/treat. Poor child, you will only have a future if you are adopted by Americans! So unlucky, this will affect her and her family for the rest of their lives. Experts, time to get to work! Unlucky child, also born in this kind country where there is a widespread lack of sympathy. But hopefully there will be a kind-hearted person who can help cure her disease. Where’s the Red Cross? Where’s the so and so “charitable fund”? Someone said only by being adopted by Imperialist America will she have a future. I think that’s true. I wish the best for this ugly duckling!!! Heaven has no eyes, poor child, why does this kind of suffering always fall upon the ordinary common people! ————At the same time, may apes [“ape” is a pun for public servants/government officials”] soon lose the ability to reproduce!! 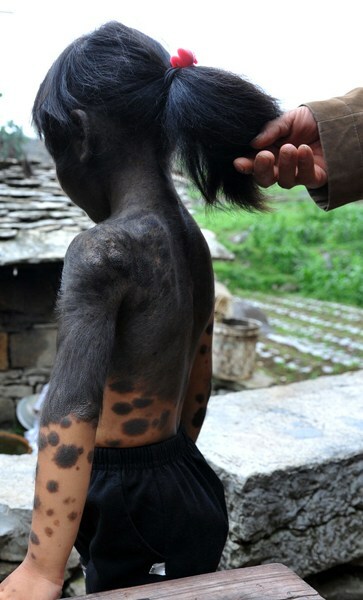 I actually wish that government officials will all become like this child, their bodies covered entirely with fur, because then research into this area will be sped up and there will be hope for this child. Sincerely hope society will give help. May she be cured soon so that a happy childhood can be returned to her!!!! China’s UNICEF (the one that is always advertising)!! You all pretend to be dead when it comes time for you to put up money!??!! Laser can be used to remove the hair follicles and colored spots. It’s just that it’d cost tens of thousands. The child only knows how to count to 5…. Can you publicize a bank account number? Those who want to donate can donate a bit, so the child can complete an education. It’s not melanoma is it? With this many spots, they’ll become cancerous when she grows up. 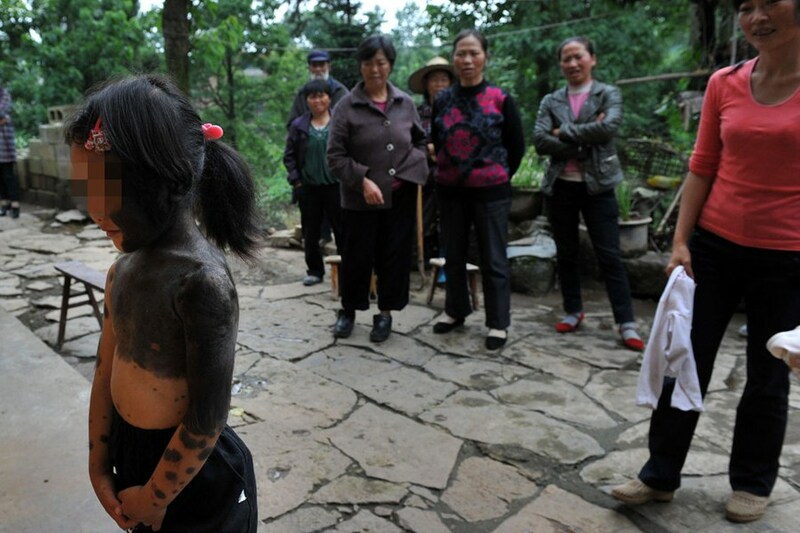 Wolverine, your offspring from when you were in China, its time you take her back to make X-Men III. Hope some expert/specialist can cure/treat her for free. NetEase, please continue to pay attention to this little girl, so that we may join hands in helping her. This age is short, it should be a time of enjoying one’s childhood. Lili, I wish you the best, and I hope you can quickly regain normalcy with everyone’s help. Isn’t elementary school compulsory, why does she not have money to go to school? Or is it the same as it is here where we are, where there is no tuition but a mess of other [costs and fees prevent her from being able to go to school]? Such a pitiful child! Where’s the Red Cross and charities!? When you really need them, they all pretend they’re blind! Then they take the people’s blood and sweat money to go subsidize those old government officials who get so many thousands in retirement pay already. What a travesty! This is the shame of our country’s people! Although our company isn’t doing well, we are still willing to donate money so this child can go to school. Telephone number 18688691752. It’s not a problem of money. Compulsory education these days doesn’t cost much money, but the discrimination by other children will only hurt her more. I hope the adult can take her to see doctors. If it can be treated, then everyone can donated money for her treatment. If it can’t be treated, then we can only hope that she has a happy life.